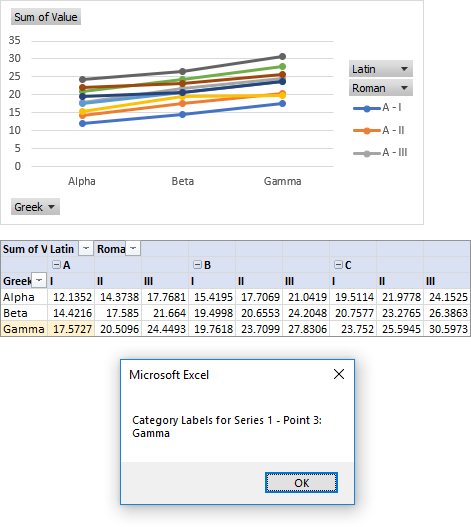 I came across a question in the Excel Reddit, Is there a way to select a chart series point and have the label name of that point be copied into a cell? 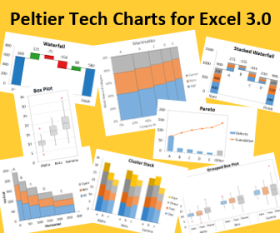 It turns out that the chart was a pivot chart, based on a pivot table with several fields in the rows area. Each field contributes a tier of labels to the category axis. 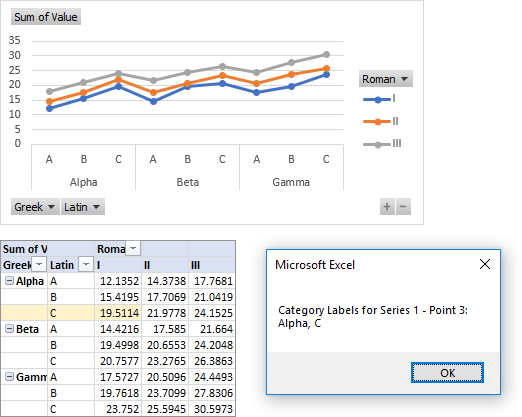 The screenshot below shows a Table of data, a Pivot Table based on this Table, and above both a Pivot Chart, with a two-tiered category axis. If you use the simple approach above, the .XValues don’t distinguish among the tiers, and the labels from different tiers are put together, separated by spaces. In the chart below, Series 1 – Point 3 has the compound label “Alpha C”, according to the simple algorithm. We need a much more detailed VBA approach. 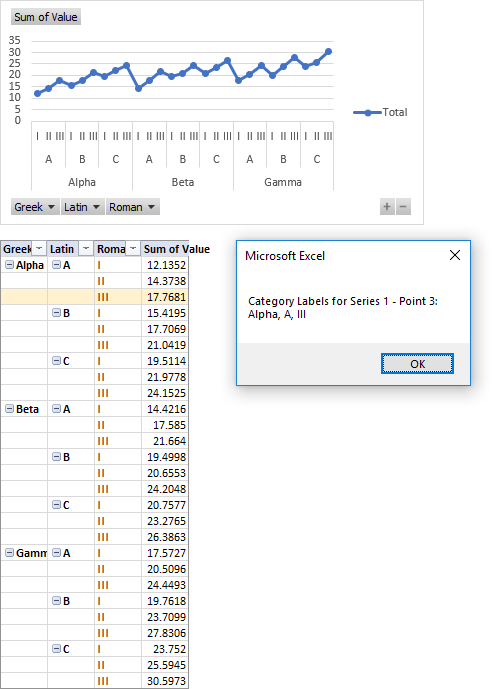 We have to parse the series formula, get the address of the range containing the category labels, then get the corresponding range, figure out how many columns of labels there are, then find the label in each column corresponding to the point. This is complicated by the empty cells in the pivot fields, so we have to keep looking upward until we find a cell with a label. Posted: Thursday, February 15th, 2018 under VBA. 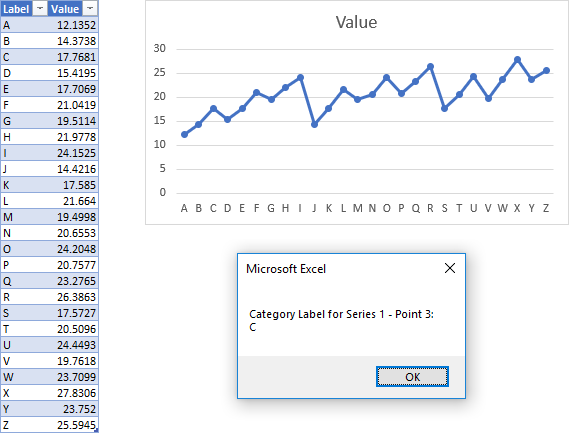 will have to be changed to read the active point and get its series and number and then place in variable. I want to use the point together with the previous point to insert a line in a scatter, with no lines. If the series is markers and no lines, applying a line format to point 3 will connect point 3 with the previous point, point 2. Apologies I forgot to mention in first message re selecting the point first. The code looks great for inserting the line segment. 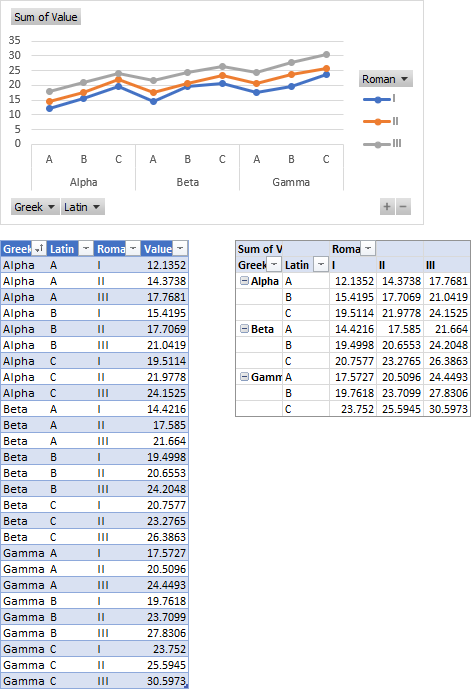 Chart will have 2 or more chart line segments, using the macro each time. 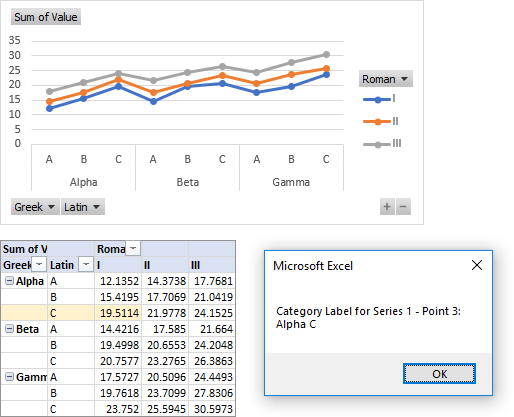 I told VBA which chart, series, and point by using ChartObjects(1), SeriesCollection(iSrs), and Points(iPt). I could have used ActiveChart to reference the chart selected by the user. Figuring out the series and point requires determining what the Selection is, and then doing some work on that. Thanks for that. I will try out over the weekend.